USES: Acyclovir is used to treat infections caused by certain types of viruses. It treats cold sores around the mouth (caused by herpes simplex), shingles (caused by herpes zoster), and chickenpox. This medication is also used to treat outbreaks of genital herpes. In people with frequent outbreaks, acyclovir is used to help reduce the number of future episodes. 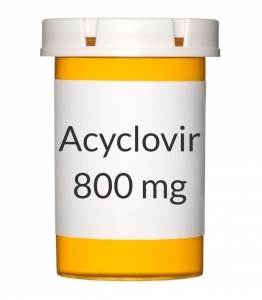 Acyclovir is an antiviral drug. However, it is not a cure for these infections. The viruses that cause these infections continue to live in the body even between outbreaks. Acyclovir decreases the severity and length of these outbreaks. It helps the sores heal faster, keeps new sores from forming, and decreases pain/itching. This medication may also help reduce how long pain remains after the sores heal. In addition, in people with a weakened immune system, acyclovir can decrease the risk of the virus spreading to other parts of the body and causing serious infections. HOW TO USE: Take this medication by mouth with or without food, usually 2 to 5 times a day as directed by your doctor. Drink plenty of fluids while taking this medication unless your doctor directs you otherwise. If you are using the liquid form of this medication, shake the bottle well before each dose. Carefully measure the dose using a special measuring device/spoon. Do not use a household spoon because you may not get the correct dose. This medication works best when started at the first sign of an outbreak, as directed by your doctor. It may not work as well if you delay treatment. Dosage is based on your medical condition and response to treatment. In children, dosage is also based on weight. This medication works best when the amount of drug in your body is kept at a constant level. Therefore, take this drug at evenly spaced intervals. To help you remember, take it at the same times each day. Continue to take this medication until the full prescribed amount is finished. Do not change your dose, skip any doses, or stop this medication early without your doctor's approval. Tell your doctor if your condition persists or worsens. SIDE EFFECTS: Nausea may occur. If nausea persists or worsens, tell your doctor or pharmacist promptly. Remember that your doctor has prescribed this medication because he or she has judged that the benefit to you is greater than the risk of side effects. Many people using this medication do not have serious side effects. Tell your doctor immediately if any of these unlikely but serious side effects occur: dizziness, drowsiness, signs of kidney problems (such as a change in the amount of urine, unusual back/side pain), mental/mood changes (such as agitation, confusion, hallucinations), shaky/unsteady movement, trouble speaking. This medication may rarely cause a life-threatening disorder that affects the blood cells, kidneys, and other parts of the body. This disorder is more likely to occur if you have conditions related to a weakened immune system (such as HIV disease, bone marrow transplant, kidney transplant). Seek immediate medical attention if any of these rare but serious side effects occur: extreme tiredness, slow/fast/irregular heartbeat, easy bruising/bleeding, new fever, bloody/dark urine, severe stomach/abdominal pain, yellowing eyes/skin, sudden vision changes, loss of consciousness, seizures. A very serious allergic reaction to this drug is rare. However, seek immediate medical attention if you notice any symptoms of a serious allergic reaction, including: rash, itching/swelling (especially of the face/tongue/throat), severe dizziness, trouble breathing. This is not a complete list of possible side effects. If you notice other effects not listed above, contact your doctor or pharmacist. In the US - Call your doctor for medical advice about side effects. You may report side effects to FDA at 1-800-FDA-1088. In Canada - Call your doctor for medical advice about side effects. You may report side effects to Health Canada at 1-866-234-2345. PRECAUTIONS: Before taking acyclovir, tell your doctor or pharmacist if you are allergic to it; or to valacyclovir; or if you have any other allergies. This product may contain inactive ingredients, which can cause allergic reactions or other problems. Talk to your pharmacist for more details. Before using this medication, tell your doctor or pharmacist your medical history, especially of: kidney problems, conditions related to a weakened immune system (such as HIV disease, bone marrow transplant, kidney transplant). This drug may rarely make you dizzy or drowsy. Do not drive, use machinery, or do any activity that requires alertness until you are sure you can perform such activities safely. Limit alcoholic beverages. Kidney function declines as you grow older. This medication is removed by the kidneys. Older adults may be more sensitive to the side effects of the drug, especially kidney problems (change in the amount of urine, back/side pain), dizziness, drowsiness, and mental/mood changes (such as confusion, hallucinations, loss of consciousness). Acyclovir does not protect against the spread of genital herpes. To lower the chance of giving herpes to your partner, do not have sexual contact during an outbreak or if you have symptoms. You can spread genital herpes even if you do not have symptoms. Therefore, always use an effective barrier method (latex or polyurethane condoms/dental dams) during all sexual activity. Consult your doctor or pharmacist for more details. During pregnancy, this medication should be used only when clearly needed. Discuss the risks and benefits with your doctor. This medication passes into breast milk. However, this drug is unlikely to harm a nursing infant. Consult your doctor before breast-feeding. DRUG INTERACTIONS: Drug interactions may change how your medications work or increase your risk for serious side effects. This document does not contain all possible drug interactions. Keep a list of all the products you use (including prescription/nonprescription drugs and herbal products) and share it with your doctor and pharmacist. Do not start, stop, or change the dosage of any medicines without your doctor's approval. Some products that may interact with this drug include: other drugs that may cause kidney problems (including nonsteroidal anti-inflammatory drugs-NSAIDs such as ibuprofen, naproxen). Acyclovir is very similar to valacyclovir. Do not use medications containing valacyclovir while using acyclovir. OVERDOSE: If overdose is suspected, contact your poison control center or emergency room immediately. US residents can call the US National Poison Hotline at 1-800-222-1222. Canada residents can call a provincial poison control center. Symptoms of overdose may include: change in the amount of urine, extreme tiredness, agitation, loss of consciousness, seizures.